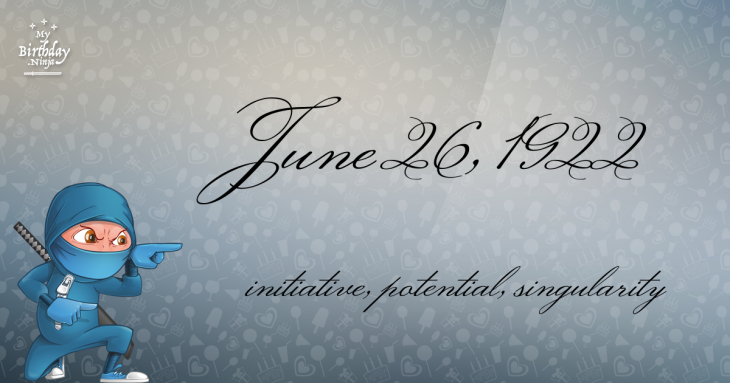 Here are some snazzy birthday facts about 26th of June 1922 that no one tells you about. Don’t wait a minute longer and jump in using the content links below. Average read time of 10 minutes. Enjoy! What day was my birthday Jun 26, 1922? June 26, 1922 was a Monday and it was the 177th day of the year 1922. It was the 26th Monday of that year. The next time you can reuse your old 1922 calendar will be in 2023. Both calendars will be exactly the same! This is assuming you are not interested in the dates for Easter and other irregular holidays that are based on a lunisolar calendar. There are 66 days left before your next birthday. You will be 97 years old when that day comes. There have been 35,363 days from the day you were born up to today. If you’ve been sleeping 8 hours daily since birth, then you have slept a total of 11,788 days or 32.27 years. You spent 33% of your life sleeping. Since night and day always follow each other, there were precisely 1,198 full moons after you were born up to this day. How many of them did you see? The next full moon that you can see will be on May 18 at 21:13:00 GMT – Saturday. Fun stat: Your first one billion seconds (1,000,000,000) happened sometime on March 4, 1954. If a dog named Daphanne - a Plott breed, was born on the same date as you then it will be 452 dog years old today. A dog’s first human year is equal to 15 dog years. Dogs age differently depending on breed and size. When you reach the age of 6 Daphanne will be 42 dog years old. From that point forward a medium-sized dog like Daphanne will age 4.5 dog years for every human year. Roman emperor Elagabalus adopts his cousin Alexander Severus as his heir and receives the title of Caesar. Przemysł II crowned king of Poland, following Ducal period. The white eagle is added to the Polish coat of arms. Richard III becomes King of England. The first Grand Prix motor racing event held. The first U.S. troops arrive in France to fight alongside Britain and France against Germany in World War I. World War II: Under the Molotov–Ribbentrop Pact, the Soviet Union presents an ultimatum to Romania requiring it to cede Bessarabia and the northern part of Bukovina. The Pan-Malayan Labour Party is founded in Malaya, as a union of statewide labour parties. Karol Wojtyła (later John Paul II) made a cardinal by Pope Paul VI. Elvis Presley performs the final concert of his life in Indianapolis. What does my birthday June 26, 1922 mean? Your birthday numbers 6, 26, and 1922 reveal that your Life Path number is 1. It represents initiative, potential and singularity. You are a born leader. You insist on your right to make up your own mind; you demand freedom of thought and action. The following celebrities also have the same life path number: Polina Gagarina, Lana Parrilla, Khaled El Sheikh, Haruomi Hosono, Dorothea Röschmann, George Carlin, Angélique Kidjo, Grace Zabriskie, Erik Weiner, Art Modell. What is the birthday horoscope for Jun 26, 1922? The Western zodiac or sun sign of a person born on June 26 is Cancer ♋ (The Crab) – a cardinal sign with Water as Western element. The ruling planet is Moon – the celestial body of moods and emotions. According to the ancient art of Chinese astrology (or Eastern zodiac), Dog is the mythical animal and Water is the Eastern element of a person born on June 26, 1922. Fun fact: The birth flower for 26th June 1922 is Rose for devotion. What is the Love Match for Jun 26, 1922? When it comes to love and relationship, you are most compatible with a person born on October 17, 1919. You have a Love Match compatibility score of +122. Imagine being in love with your soul mate. On the negative side, you are most incompatible with a person born on December 20, 1902. Your incompatibility score is -152. You’ll be like a cat and a dog on a love-hate relationship. Arf-arf, I want to bite you. Meow-meow, stay away from me! What is the popular baby name on 26 Jun 1922? Here’s a quick list of all the fun birthday facts about June 26, 1922. Celebrities, famous birthdays, historical events, and past life were excluded. 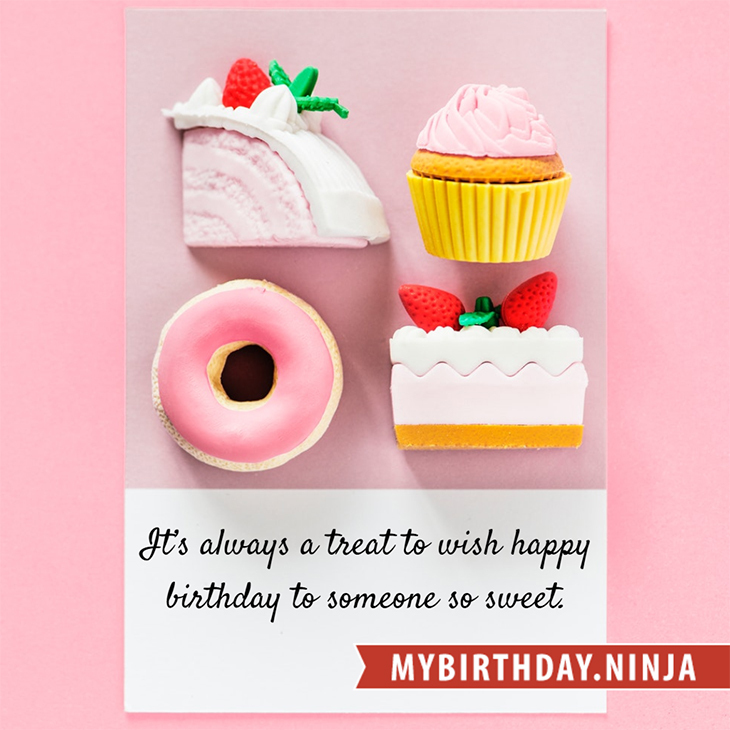 Try another birth date of someone you know or try the birthday of these celebrities: July 28, 1960 – Luiz Fernando Carvalho, Brazilian director, producer, and screenwriter; May 10, 1970 – Dallas Roberts, American actor; January 11, 1949 – Frederick "Dennis" Greene, American singer and actor (Sha Na Na) (d. 2015).